Although car companies&#8217; product placement in movies and TV shows is nothing new, the practice is accelerating, growing 33.7% in 2007 and outpacing a 25.8% increase in Internet advertising. Ford Motor Co.’s long association with the James Bond franchise, including a cameo by its restyled European Ka microcar in the latest film “Quantum of Solace,” not only is a marketing ploy but also an indicator of a larger product-placement trend taking place in the auto industry. Although auto makers’ product placement in movies and TV shows is nothing new, the practice is accelerating, growing 33.7% in 2007 and outpacing a 25.8% increase in Internet advertising, says Leo Kivijarv, vice president of research, PQ Media LLC, a Stamford, CT-based custom-media research firm. “A lot of brands have opened up offices in Southern California near studios, so they can pitch ideas (for product placement),” he tells Ward’s. In 2007, overall product-placement spending totaled $2.9 billion in the U.S., while worldwide the number swelled to $4.3 billion, Kivijarv says, noting the automotive and clothing industries account for the biggest chunk. In “Quantum of Solace,” set to debut in the U.S. Nov. 14, the Ka won’t be driven by Bond, but rather by the new “Bond girl,” Olga Kurylenko. The Ukrainian-born actress and model plays the role of Camille, who possesses an “independent spirit, sense of adventure, bravery, style and beauty,” Ford says. 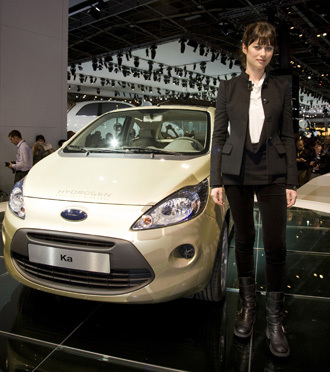 The attributes of Kurylenko’s character played a large part in Ford’s decision to place the Ka in the new movie, says Joanne Sheehan, head of communications planning for Ford of Europe. Ford has enjoyed a long relationship with the Bond franchise, having featured vehicles in several movies, Sheehan says, which allows the auto maker early access to scripts in order to decide whether one of its vehicles would fit. The film featured a Jaguar XKR; Land Rover Range Rover; Volvo S60 and S80; Ford StreetKa and Aston Martin V12 Vanquish; plus two classic cars, the Ford Fairlane and Ford GT. Since then, Ford has sold its Aston Martin Lagonda Ltd., Jaguar Cars and Land Rover subsidiaries. “We advertise the products (that appear) in the movie, but we do it using the theme of James Bond, and we agree to carry the in-cinema date,” she says. Ford’s choice of the European Ka appears odd in the current Bond movie, as the vehicle is not available in North America. Could it be an attempt to gauge U.S. consumers’ acceptance of such a small vehicle? While product placement in movies and TV is becoming common practice, many auto makers are finding it difficult to gauge its effectiveness. Frank Zazza, CEO of iTVX, which measures branded entertainment, says there are ways to measure the success of product placements. His firm counts Ford, as well as Toyota Motor Corp., Chrysler LLC and Nissan Motor Co. Ltd. among its clients. Much of the success resulted from a promotion BMW launched in the U.S. in conjunction with the summer 1996 release of the movie, Zazza says. The promotion drove consumers into showrooms, and although not everyone left with a Z3, BMW’s U.S. sales rose from 8,341 in April to 10,774 in July of that year, Ward’s data shows. Indeed, many advertisers now are monitoring commercial ratings, instead of traditional program ratings, Zazza says. In addition to working on a more subtle level than traditional advertising methods, product placement also pays dividends over a longer period.